A delicious and easy to prepare marinade consisting of ingredients that can be easily found at a Chinese grocery store. Place tenderloins in a shallow glass dish. In a small bowl, whisk together soy sauce, hoisin sauce, sherry, black bean sauce, ginger, sugar, garlic, sesame oil, and five-spice powder. Pour marinade over pork, and turn to coat. Cover, and refrigerate for at least 2 hours or up to 24 hours. Preheat oven to 375 degrees F (190 degrees C). Remove tenderloins from refrigerator while the oven preheats. 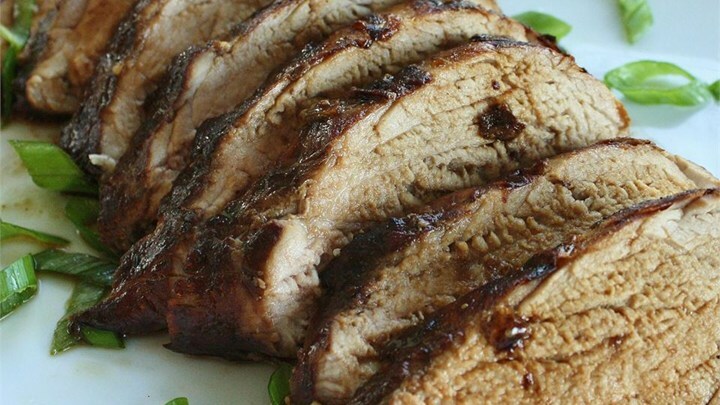 Bake pork in preheated oven for 30 to 35 minutes, or to desired doneness. Let stand for 10 minutes, and then slice diagonally into thin slices.